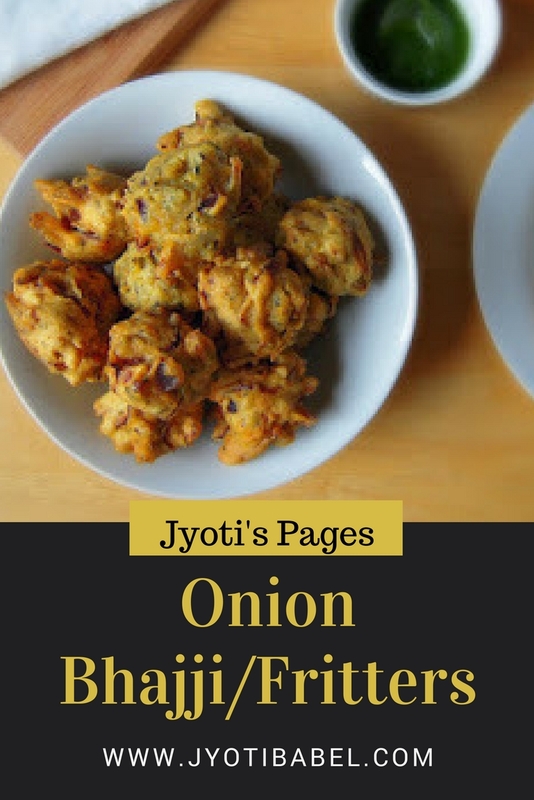 Onion Bhajjis are Indian savoury onion fritters; they a crowd pleaser. It is one of the popular street foods in India. I love to have them hot with a cup of tea. I had made them to take it to my work place and every body enjoyed it a lot. Few of them even remarked that they were really moist and flavourful unlike the ones you get in shops, which tend to be very dry when cold. The secret to it is adding a pinch of baking soda to the batter, it gives the inside of the bhajji a soft texture. I also add a couple of spoons of rice flour in the batter which gives a crispy crunch outside. 1 cup chickpea flour, shifted. 1. Peel the onion and cut it into four halves. Slice them thinly. Put the sliced onions in a large bowl and toss with the salt. Set aside for 10 minutes. 2. Add the chickpea flour, rice flour, chile powder, cumin, turmeric, ajwain, coriander leaves, baking soda,kasoori methi, green chilli and stir well. Add a couple of tablespoon of water to form a thick batter. Do not add water add water all at once, add spoon by spoon and stir with a spatula to check the consistency. 3. Heat 500 ml oil in a frying pan. When bubbles appear at the bottom of the pan lower it to medium. Drop tablespoon of batter into the hot oil. Fry 5-6 bhaajis at a time. If the pan is too crowded they will not cook evenly. Fry them till they are golden in colour. Stir it occasionally so that they are fried evenly. 4. Remove them with a slotted spoon and drain them on paper towel. Serve hot with coriander chutney or tamarind chutney. It can also be served with ketchup, pairs best with a cup of hot tea or coffee. 1. Shifting chickpea flour helps in avoiding lump. 2. Make sure baking soda also has no lumps. Once the batter is made, don't let it sit for too long. Start preparing the bhajis in 5-7 minutes. 3. It is best to drop the batter in the oil using your finger. It can be a bit messy but helps in getting uniform shapes which in turn helps in uniform frying. 4. You can make them in advance and heat them in the microwave before serving. Have a nice weekend. Thank you for stopping by! Cheers! Delicious fritters an y time with chai!! link it to my event teatime!!! Perfect tea time snack!!! Looks really crispy & you've perfectly made too! Looks delicious! And I do love onions. Fritters like these, whether with vegetables or say moong dal, are my go-to when I can't think of any other quick snacks! Rice floor and pinch of soda... now we know the secret! As I am reading this, my part of Mumbai got the first pre monsoon showers!